Q: What lured you to underwater photography? A: I’ve been into the water since I was a little kid – swimming, beach holidays, surfing – and when I was old enough to drive, I got into surfing in a big way. I bought a DSLR camera and water housing to shoot all my friends. When I emigrated to Australia from the UK in 2007, I got my dive ticket and now I’ve fully evolved into underwater photography. Q: Did that fact Australia is “girt by sea” influence your move to Australia? A: Absolutely. My decision to emigrate was through surfing and then diving and photography, first and foremost. Q: How important has travel been throughout your career? A: The reason I love photography so much is it’s a good excuse to travel. Photography is a reward, I suppose. When you get home it doesn’t become a distant memory, you’ve got really beautiful pictures, too. I love taking people with me, showing them the beauty out there – not only overseas, but also in our own backyard. Q: Do you have a favourite destination? A: That’s a hard one. I really love Cuba, Costa Rica, Indonesia ... but perhaps it’s the Solomon Islands. There’s such variety there, you can see pretty much everything and anything, and it’s so close. A: I’m quite possibly off to Antarctica in March. Then the Philippines for a load of night diving in April; Great White Sharks in South Australia in May/June; the end of June is Great Barrier Reef for Minke Whales; August, Tonga for Humpback Whales; Solomon Islands in November, and then anything else that pops up in between, I guess. 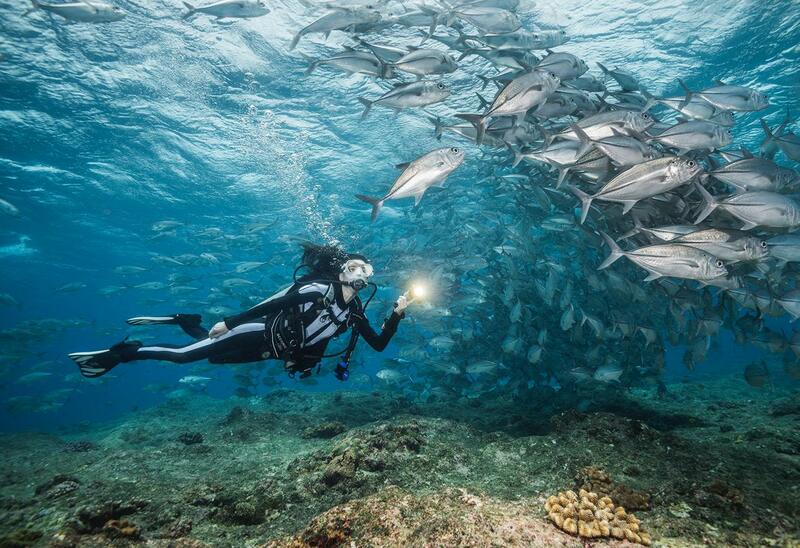 Q: What is your top underwater photography tip? A. If you want eye-popping, attention-grabbing shots, then first and foremost it is lighting. As soon as you go underwater, you start to lose colours. Secondly, it’s composition. I always tell people to get low and on eye level with your subject, or even lower, so you can look up and frame it against the blue water.